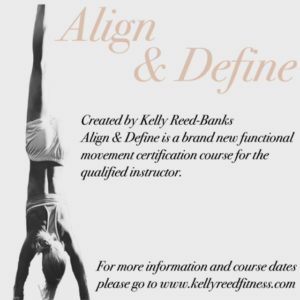 Created by Kelly Reed-Banks, Align and Define is a brand new functional movement certification course for the qualified instructor. Align and Define takes you through blocks of body weight exercises to target overall strength, balance, flexibility and core conditioning. Gentle enough for those beginning a fitness program, yet because there are progressions in the class, those that would like more of a challenge have that option as well. A class where everyone feels included and can progress at their own level. Finishing with a deep relaxation section. This online certification course will teach you how to not only deliver this beautiful flowing class but how to adapt for your participants and how to progress them at a level which is right for them. Open book theory exam to be completed and emailed in for assessment. Full content videos on each block of the class so you can learn the pro choreographed class as well as BONUS video’s on theory breakdown, guidance on class structure, delivery and how to modify and progress your participants. .
PPL free cd to teach your Align and Define class to. So what do you need to do to gain this certification? Align and Define is a freestyle class, where Kelly encourages you to create your own sequences, blocks and content however you do have the option to gain new choreography content, online support for your classes & marketing information by going the Align & Define academy for only £50:00 for the year!